Chinese Money Supply - How Do You Say "Rube Goldberg" in Chinese? 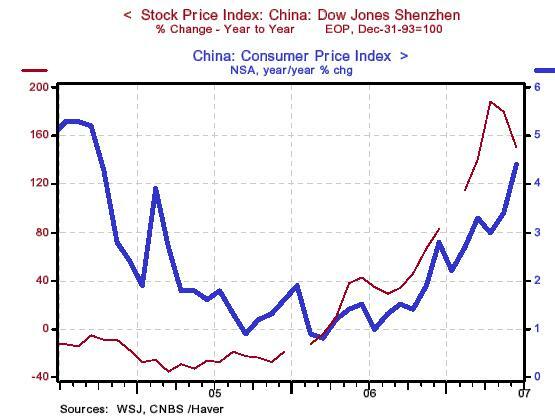 China has an economic problem - inflation. When I speak of Chinese inflation, I am referring to what the People's Bank of China (PBOC, not to be confused with PB&J) is doing - creating massive amounts of credit "out of thin air." Chart 1 shows that the total assets on the PBOC's balance sheet grew by approximately 29% in the 12 months ended May. Although that is down from peak growth of 38% in the 12 months ended September 2005, 29% still is a sizeable increase in central bank credit creation. What is driving this rapid PBOC credit creation? Chart 1 also sheds some light on the answer to this question. 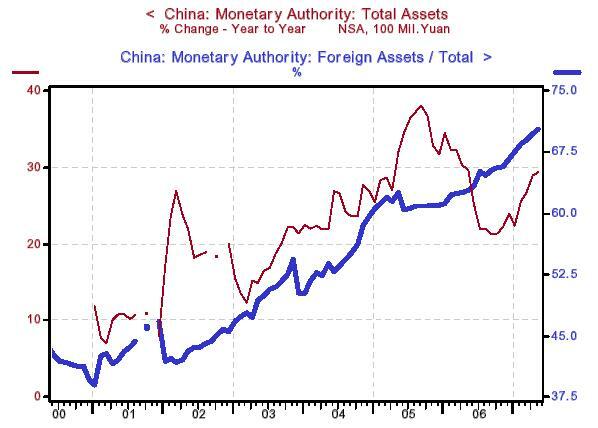 The blue line in Chart 1 is the proportion of PBOC total assets that are foreign related. As of May, approximately 70% of PBOC total assets were foreign related. Because Chinese government policy is to manage the Chinese exchange rate, especially with respect to the U.S. dollar, and because the U.S. dollar "wants" to fall in the global foreign exchange market, the PBOC is forced to buy dollars in order to keep the Chinese yuan from rising faster relative to the dollar. What has been the result of all this PBOC inflation? As Chart 2 shows, more rapid increases in the prices of consumer goods and services and corporate stock prices. The Chinese government has become concerned about the pick up in the prices of Chinese goods/services and assets. It wants these price increases to slow down. If rapid growth in PBOC-created credit is what caused the acceleration in Chinese goods/services prices, then a slower growth in PBOC-created credit ought to calm things down. So, did the Chinese government instruct the PBOC to cut back on its credit creation directly? No. The Chinese government has instructed the PBOC to raise interest rates on Chinese bank deposits (the Chinese still have a version of the old Fed Regulation Q) and the interest rates on bank loans. Also, in order to encourage Chinese citizens to hold onto the rapidly growing deposits, which have been created by rapidly growing Chinese bank credit, which has resulted from the rapidly growing PBOC credit, the Chinese government has cut the tax on interest earned on Chinese bank deposits. Talk about a Rube Goldberg approach to reining in central bank credit creation. Not only is this a convoluted way to manage monetary policy, it is destined to fail. As long as the PBOC attempts to prevent the Chinese yuan from appreciating at its "natural" pace versus the U.S. dollar, the PBOC will be forced to continue inflating. As Milton Friedman, may he rest in peace, used to say, there are simple answers to problems but not necessarily easy answers.